Este texto foi traduzido usando Way Hostel está a uma curta distância da maioria dos pontos turísticos de Madrid e fica perto do mercado Rastro semanal, Puerta del Sol, La Latina e Plaza Mayor. Convidados Hostelworld freqüentemente recomendar passeios gratuitos deste hostel como uma "ótima maneira de ver a cidade", dizendo que eles são "realmente útil para aqueles que vêm para Madrid com nenhuma idéia sobre o que fazer '. Nossos visitantes também têm elogiado a equipe por ser "extremamente útil e [ter] um grande conhecimento da cidade", dizendo que o hostel 'dá-lhe um olhar para dentro Madrid "e é" a menos de 300 metros de uma estação de metrô, mas em um rua lateral que torna muito tranqüila ". The first idea for the creation of Way Hostel took place in the summer of 2008. By that time, there was not even a name, just a place that appeared to be ideal for our goal, the one that involved opening a new concept hostel in the city. 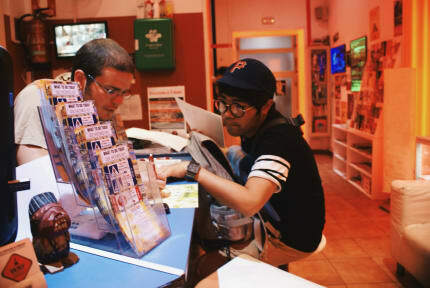 We only knew the name should have 3 letters and rooms should be wide and diverse, because the new type of “backpackers” coming to town were not satisfied with the cheap accommodation that existed in Madrid. With all the will, and dreams ahead, we began to reform the building and create the first strategies to develop what soon became the best hostel in the city. A great place, with a great name and a great location was not enough, so our next move was to build up a young and multilingual team with ambitions. Today, after more than 6 years, Way Hostel turned out to be the best location in its category, making it the perfect spot for great memories to more than 150.000 guests that have given us a chance. Once here, you will be the judge. Our motivation has been, and will always be the same: it is important that you come, but far more important that you come back. This is why we offer a huge variety of rooms and prices, activities and services that will assure a great stay. From double private rooms ensuite to large dorms and only female dorms; from free, to “backpacker´s” price activities; from Spanish, to South Korean members on Staff; once here, you will never want to leave! And if you are planning a group trip, with friends, family, uni or whatsoever, we will offer the value for the money of the market so you can enjoy everything else Madrid has to offer! We offer a wide variety of activities including a walking tour, tapas tour, pub crawl and a Flamenco show. We also organize 'milongas', the famous tango dance celebration, every Saturday night at the hostel free of charge for our guests! So if you happen to stay during the weekend, you should try out your dancing skills! Almost 7 years has gone by since we opened, so we thought it was time to update our facilities and fulfill our customer´s needs, keep up with the new competition in town and give a nice design to our common areas and rooms. Bastante recomendado! O hostel está bem localizado, perto dos pontos turísticos. O staff é incrível, sempre pronto a ajudar. O ambiente é muito agradável e limpo. Voltaremos com certeza !! Well for me was the best hostel ever I have been traveling for around Europe and this one surprise me in a great way!!! I would love to mention this #miguel is the best pubcrawl guide ever and Carlos and pole just wanna say that I’m really gonna miss them. Muito bom o hostel, pessoal que trabalha muito simpáticos!!! This is an amazing hostel for solo travellers, it has activities, an awesome vibe starting with the staff (those guys make the place shine, congrats! ), people are fun and friendly and you have all the conditions needed to feel at home. Had some of the greatest days while in Madrid and the hostel definitely made its part in it! A Equipe do Hostel é muito atenciosa. Staff is very good and location too...the bathrooms can be better when i talk about bathing... all the rest is really good! I recommend this hostel! Very good localization, and environment. However, people need to pay more attention to the noise they make when they are in the living room, since, the noise reaches the bedrooms easily. Hostel simpático porém muita gente para poucos banheiros!! Péssima organização do quarto Pq como sempre tinha alguém dormindo a luz estava apagada enquanto em outros hostels a luz tinha horário para acender e apagar! Impossível sentar na beliche de baixo pois era MT baixo! Stafs fofos e davam ótimas dicas de coisas locais ! Este texto foi traduzido usando Nós nos preocupamos acima de tudo sobre os nossos clientes e suas necessidades. Nós geralmente atraem pessoas com idades entre 18 e 60 anos que têm uma boa vibe e estão abertas a conhecer outros viajantes ávidos. Para se divertir fazemos pubs, um passeio tapas, paella noite e beber jogos, ou saímos para as casas noturnas e bares nas proximidades. Às vezes nós apenas chill out no nosso salão recém-remodelado.